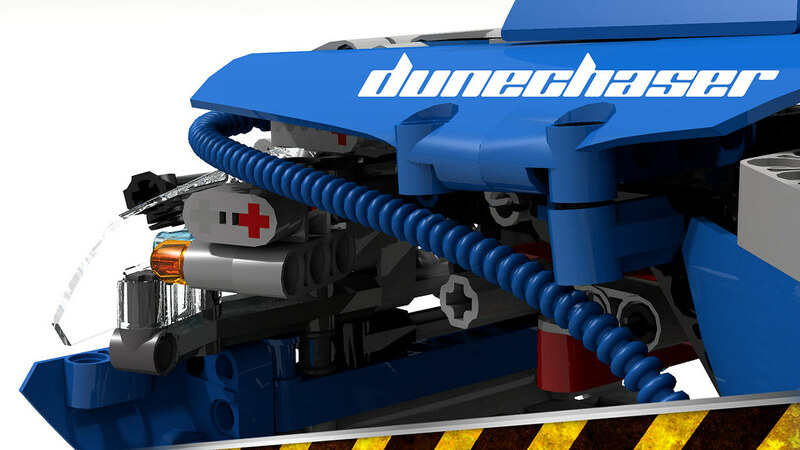 In the sequence of my first entry for the LEGO Technic 2012 competition (see the earlier post about The Dunechaser here at TBs ), I had plan to do also an Offroad Quadbike. Although the time is vanishing and each day this turns more and more unlikely to become real. 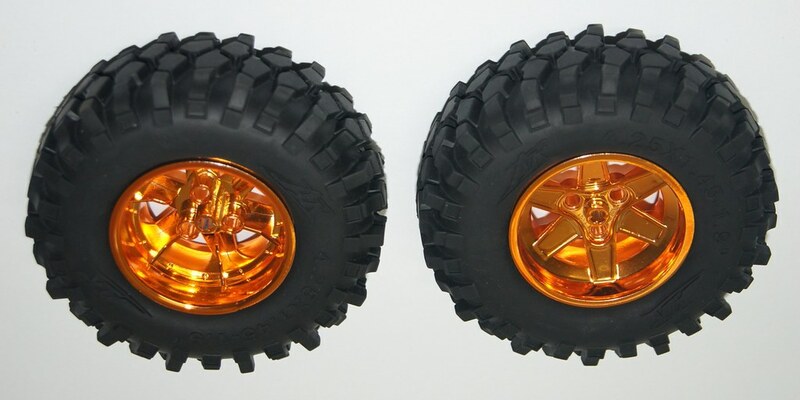 Similar to what was proposed for the Dunechaser tires, one of the ideas I had for the Quadbike was also an exclusive set of specially decorated tires and wheels. 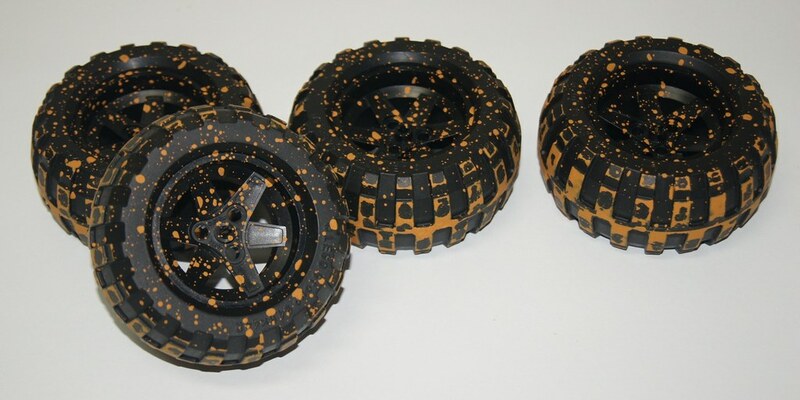 For the Quadbike I thought about tires speckled with mud, as it was supposed to run offroad and to use the 9398 4x4 Crawler original balloon tires. I made several tests until I get the desired effect and color. 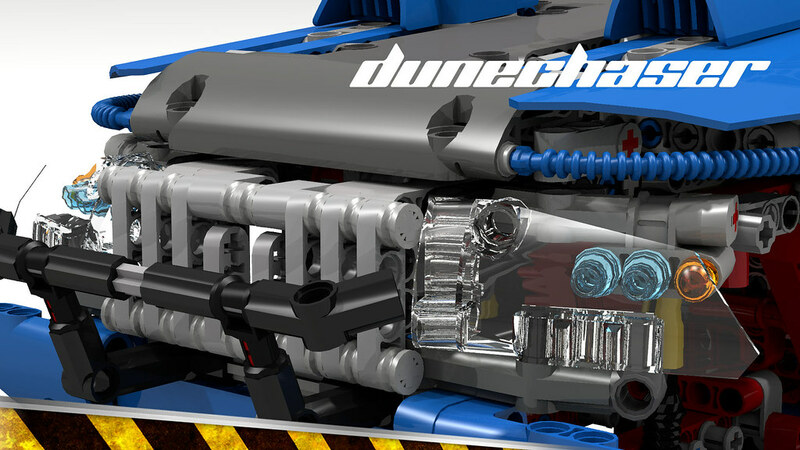 It was first tested with the Unimog tires as they were also that I've chosen for the Dunechaser. From the photos below you can get an idea of what was my intent and the results I've achieved. 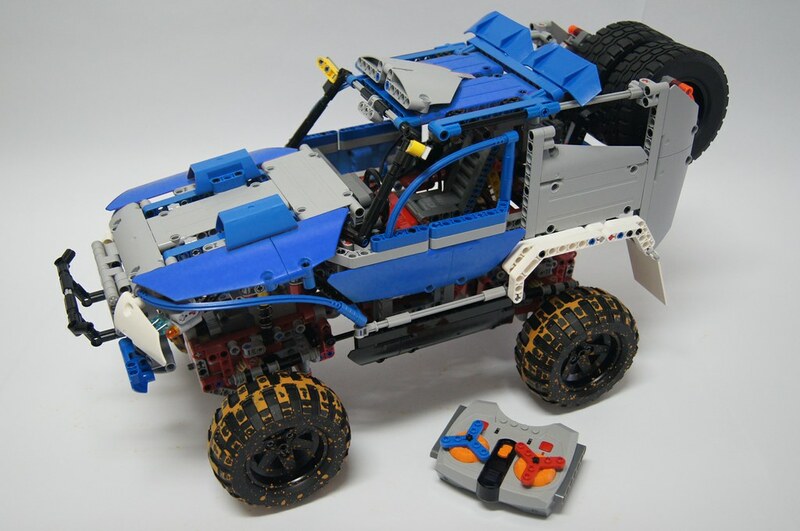 Since the Dakar Rally was diverted into new paths, countries and terrain conditions, these could somehow also fit into the original Dunechaser. Although I still prefer to see it with Unimog tires. What do you think? Would you prefer the sand and dust dirty version, or the mud speckled ones? The balloon or the straight tires? Additional photos added to the Dunchaser set of photos, at my flickr account. 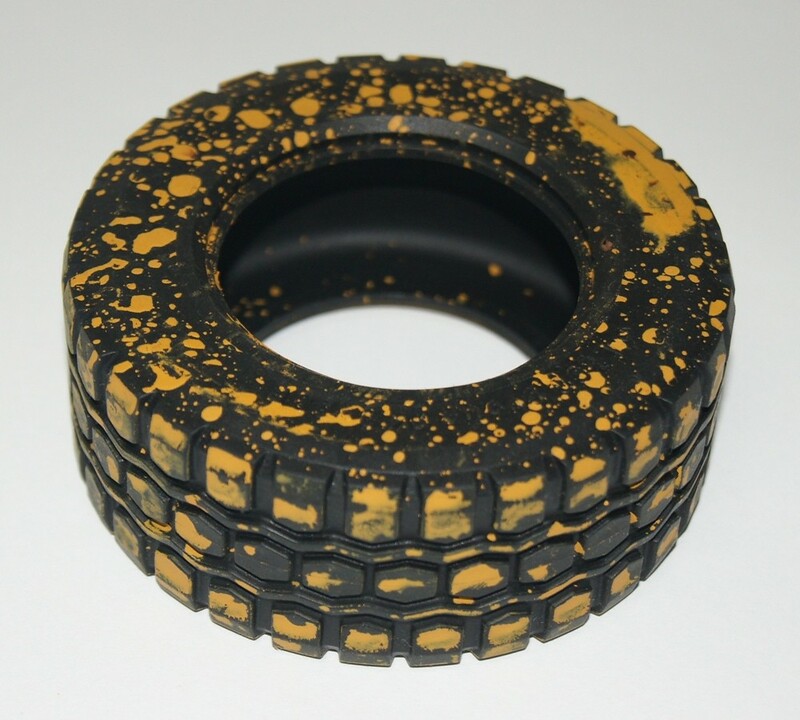 Please notice the tires shown above, are custom Hobby RC tires (by Ansmann), and thus not intended for the present competition. Meanwhile I take also the opportunity to show a couple of new renders I did, after the Dunechaser public presentation last week. One with some of the hood panels removed, so one can see the winch behind these. 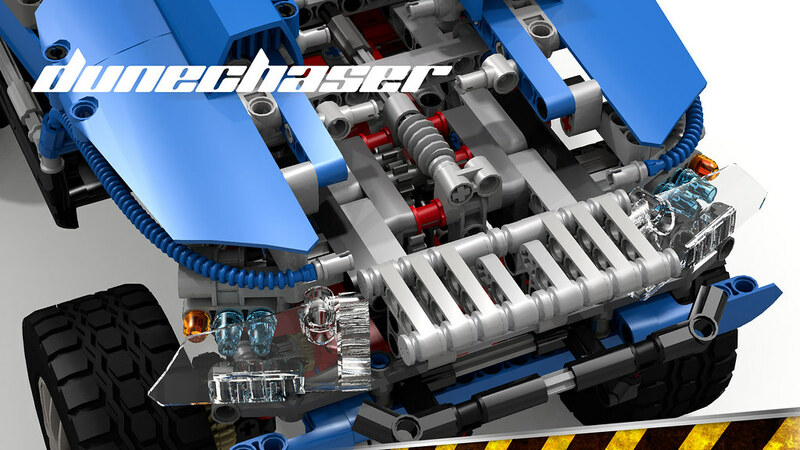 You might remember the Dunechaser features a winch function, where the winch is not attached to the front chassis, but well hidden behind the front grill (open in the render below). As you can notice, the winch module itself is quite identical to the motorized winch on the 8110 U400 Unimog. This and the next renders show also the latest modification I did to the headlights, hopefully a consensual improvement detail. I've changed the 1x1 round plate that mimics the direction blinkers, by a light bulb (58176). They should look a lot better behind the proposed trans-clear panels, because the trans-orange "lamp" gets bigger and more visible. Highlighted you can see also the large trans-clear panels proposed, here used as covers for the headlights. If you have not yet voted for the Dunechaser, what are you waiting for? Please support if you liked the ideas and design proposed. I think the unimog tires look way better on your dunechaser. 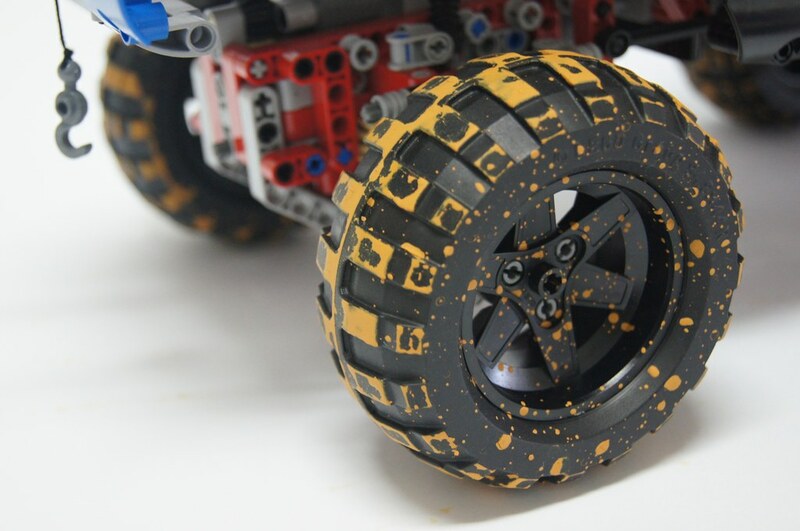 I'm not really a big fan of both the dusty and muddy tires, but I agree, that the original (the sand ones) look better. Did you really paint the tires? So you can't get the patterns off? It also depends a lot on the perspective where the photos are taken from. These were made exclusively for test purposes and are not permanently decorated. I can't reach the VOTE page. I am very excited to see the finalists!